I’m a huge Disney fan – after all, I grew up watching & enjoying the very best movies they ever created. From Aladdin to Lion King and Snow White, my siblings and I watched all their movies at least 50 times each, if not more. We also had separate Sing-A-Long VHS tapes that family brought us from abroad – we knew the songs backwards and forwards and in two languages. And now that I’m about to hit 31 *gasp*, I’m still as big a fan of Disney as ever. A few years ago I went to Disneyland in Los Angeles and had a blast seeing the characters and riding on the amusement rides (but don’t even get me started on the long wait lines… that part of it was a huge bummer and made up most of the day). The best moment in the day was a fun parade show featuring all the popular characters. No lines, all celebration, everyone sang along to popular Disney songs, and the characters were acting and dancing – it was Disney heaven for my friends and I. One of my friends even ended up working there! I haven’t had many opportunities to see Disney shows live, but I do have a ‘bucket list’ of shows I would like to see. From what I hear, these are all amazing! I have never seen an ice show, and I can only imagine that they are spectacular to watch live. I know Disney has Frozen on Ice, which makes sense, because what better setting is there for Frozen than an ice show? I’m a huge fan of ice skating – it’s so elegant and beautiful, and if you combine it with the wonderful plot and popular hit songs of Disney movies, it must be all the more enjoyable. From what I can see, they do all sorts of Disney on Ice movies and songs… just watching the Youtube highlights video gets me hyped of experiencing it live. Perhaps at some point they will hold the show closer to where I live, or I will travel to it. Disney Cruises are the utmost of luxury and fun combined, and if I’m going to take any cruise at all, there is no doubt that it will be in their cruise line. The thing about Disney Cruise Lines is that they have shows that are available only in the cruise ships, like Tangled: the Musical. Tangled happens to have one of my favorite soundtracks of Disney. But aside from that, it’s a cruise ship designed to celebrate everything Disney – what more can a fan ask for? There are even cruises to their private island! Between the live shows, character experiences, Disney 3D movies, and pirate deck parties, I could have the time of my life. They also have fun Disney play & storytelling youth clubs for kids so adults can enjoy themselves separately. My boyfriend would probably love the “Star Wars Day at Sea” most of all! Ten years ago, I went to my first Broadway show: Beauty & the Beast. To say that it was incredible would put it mildly. Everything, from beginning to end, from every character to the unreal special effects, was perfect. To today, I don’t understand how they turned the Beast into a prince on stage – it was like a split second and pow, he was a human and not in costume. Even the petals of the rose would come down as the show progressed – such attention to detail! And of course, the singers were all very talented and true to the movie. So now that there’s an Aladdin on Broadway, I feel the obligation to experience it as well. If it’s anything like Beauty & the Best, it will be spectacular, and reviewers say it is. The word on the Twittersphere is that it’s one of the best musicals to grace Broadway. Using lighting technology and special effects, this parade is supposed to be one of the best in the world. It features a combination of classic Disney characters with dazzling lights and a whole bunch of movement and energy. It looks like a lot of fun to enjoy, especially with little kids who would be fascinated by the many colors and designs created by lights. When I see the Youtube video, it feels somewhat like a kid’s toys that light up and plays the same bit of annoying music over and over. 🙂 (Maybe they should consider adding some variety to the music.. hearing 20 minutes of the same song is a headache!). However, creativity abounds here – everything is so well thought-out and designed and the colors are just stunning. I really love the dresses with lights on them, Cinderella’s pumpkin carriage and the fireworks on the US flag at the very end. Superb show! 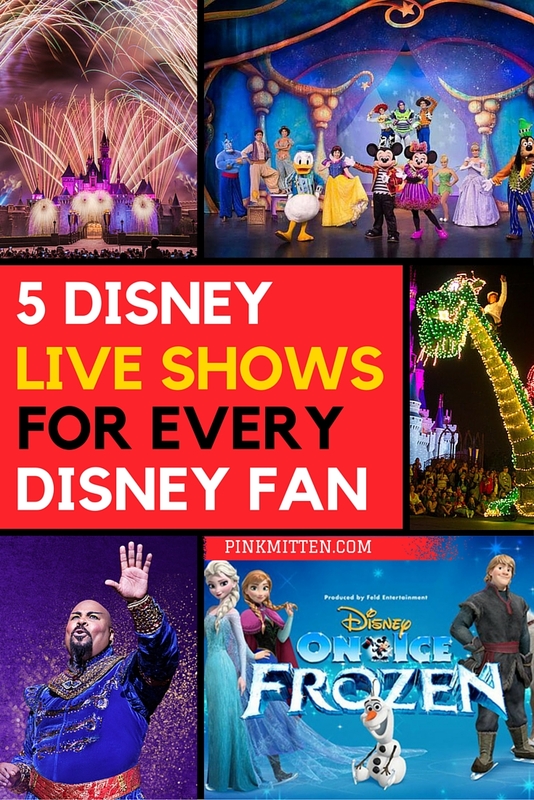 Have you been to Disney shows? Which was your favorite? Although I have been to many Broadway shows in years past–unfortunately I never made it to any of the Disney productions. I wish I had–I know people who did and loved them. Alladin will probably rank right up there with all the rest!! These are great suggestions! I’d love to see Aladdin on Broadway, for sure! A Disney cruise is on our bucket list. When we have time to go, they’re always sold out! Disney on Ice is definitely on our list of must-see Disney shows. It looks like so much fun to watch with the whole family.